Recently Wisecleaner has launched a new website Euask (www.euask.com), which is a space to share your ideas and to assist each other. The most attractive point is money rewarding. It means your kindness to give help or idea sharing on line are rewarded. Wisecleaner is the provider of Wiseclean, the popular computer optimizing serial applications. Their millions users are throughout all over the world. Wise users always collaborate and support each other. In Wise Assistant Forum, they are eager to share their using experience, seek help when meeting problems, try to assist others and discuss points on Wise products and all aspects of computers. Euask is based on Wise Assistant Forum and specialized in Wise applications and an all IT related knowledge. Now it has expanded the community to reach out to all hot points. If you’d like to also discuss or share your thinking on current affairs, entertainment, art and literature, travel, sports, pets, business and finance, food and drinks etc., please sign up an account there. It’s a place to express yourself, to communicate with others in a free environment. You could put on any of your inquiries, interest topics, your hesitation and dilemma, your new plans and anything you’d like to share. The others may give you different consideration, knowledge you are not familiar with, experience or lessons for some situations. At the same time, you are also the providers of all of above. That’s how the mutual assistance acts. Sometime you may not care about the little money earned, but the money given by Euask represents the reward for your kindness. It means your expertise or suggestions do help someone. Do you smile when thinking of this? Just remind you not to forget to mark the best reply when you get the solution. It’s for closing off the inquiry and then Eusask will pay the money to the winner according to your choosing. That’s the way you say thank you to the helper. 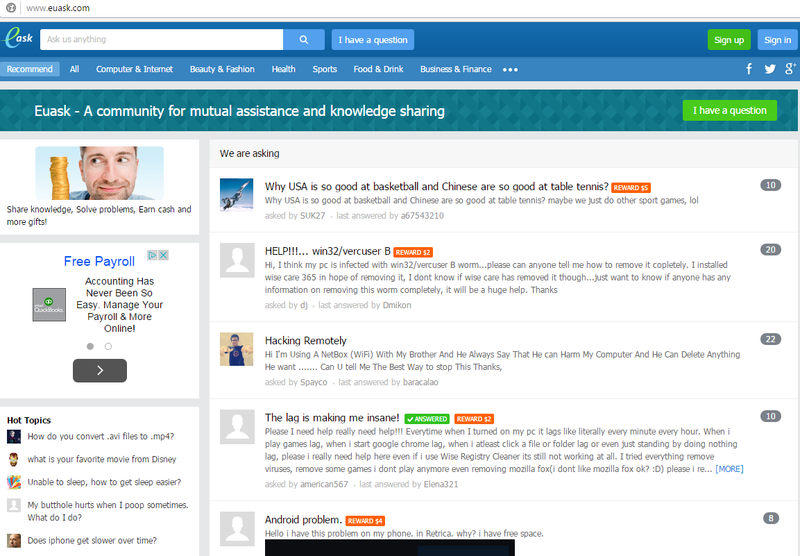 Euask is the community to ask and give answers, share, discuss and rate ideas, help and get rewards. Euask connects us and makes us close. Now have an account here.